More and more I’m seeing that talent acquisition is quickly changing from acquiring talent to ‘attracting’ talent! I have yet to see any corporate TA shops make the name change and start calling themselves the Talent Attraction Department, but it won’t be long. This change is happening because of Recruitment Marketing. As an organization, we can longer just sit back and wait for talent to come to us, that’s talent acquisition by definition. Most organizations today are competing daily for the best talent available in their market, and if you’re sitting back, being reactive, your organization is going to lose and you’ll probably be out of a job. That all sounds really great, but as a TA leader, it just sounds like more stuff just got dropped on your desk that you’re now responsible for! Now you have the entire TA process, assessments, background and references, TA technology, branding, careers page, candidate experience, I mean what’s one more thing like Recruitment Marketing!? Our reality as TA Leaders and Pros is that Recruitment Marketing can get very complex. Whether you think you are or not, all of us are at least doing a little recruitment marketing. You might not consider it ‘marketing’ but if you’re trying to get people to view and apply to your jobs, that’s a least a start. The big question comes down to what should we be doing? 1. Take back control of your brand. Yes, you have a brand, you just might not be controlling it! Make sure your brand is clearly defined on the largest branding device most organizations have, which is your career site, then build from there. 2. Figure out how to keep interested people, interested! Way too many TA shops make candidates jump through hoops and fully apply to show interest. Stop that! Ideally, all you need is a name and one piece of contact information. Figure out how to make that happen. 3. Continue to communicate with those people who are already telling you they’re interested. This means you need to fully utilize your own database and start building talent pools. From there, add to the pools from other sources. Don’t get super hung up on what to communicate. Yes, you would love to send content to them that they would love, but at the very least communicate out to them that “hey, we see you! we want to see more of you! let’s find a way to make that happen!” One of the biggest complaints from candidates is simply they don’t hear from organizations. 4. Find a platform that will easily allow you to nurture these pools of candidates. CRM technology is great for this, but I’ve seen people do it through basic email programs. You need to plan a strategy of what and how often you communicate out to these pools. More than likely this will involve a social media strategy. 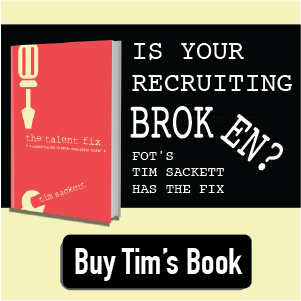 Let’s face it most of us are idiots when it comes to recruitment marketing! My other piece of advice, go take your marketing folks to lunch. Pay for the lunch and ask for help. Beg for help. Marketing folks love to win. Nothing says win like getting people hired!